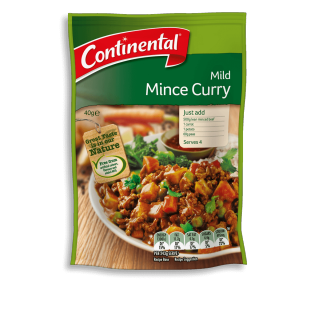 Enjoy Continental's fast & simple Indian Mild Mince Curry, blended with real flavours to give you that authentic experience. Learn how to create this dish here. Corn starch, spices, maltodextrin (from wheat), onion powder, sugar, salt, natural flavours, burnt sugar, yeast extract, sunflower oil, garlic extract.